Hanif Paribahan (হানিফ বাস সার্ভিস) is one of the largest bus service provider in Bangladesh. It is also known as Hanif Enterprise. They provide both luxury and normal bus service. It is a private long route bus service company. They have bus counter and services in different places in Bangladesh. Here in this article, I will give you some special information. They are ticket counter location, address and Contact Number (Mobile Number) of the service. Hanif Enterprise was established by successful Bangladeshi entrepreneur Jaynal Abedin. He started entrepreneurship with a small truck. Now this enterprise has more than 1200 AC and Non-AC buses in various road of Bangladesh. 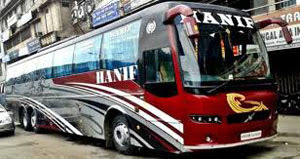 Hanif Bus counter locates at many places in Dhaka and all over the country. The mission of Hanif Enterprise is to provide the smoothest journey possible. It is one of the best for the maximum level of luxury and comfort. * Passengers should reach at the bus stand at least before 20 minutes of departure. * A passenger can take highest 10 kilogram weight with him/her. * Passenger must take a token before putting the luggage in box. * Passenger could not carry illegal products with them. * For overweight customer have to pay extra money. * For cancellation of the ticket, passenger must contact with bus Counter before 3 days of tour. * Passengers must follow company’s refund policy for cancellation of tour. Hanif Enterprise also provides online ticket booking service for its customers. There are many benefit of buying ticket from online. Costumer don’t need to go bus counter for buying tickets, it saves their valuable times. Ticket will be delivered to customer’s doorstep. Ticket can buy at any time of the day. Another benefit is there is a lot of offer in online ticket booking. For any troubles related to ticket booking there is 24 hours open customer care. Anyone can simply buy ticket from online by visiting www.sohoz.com and www.busbd.com. Online ticket booking is a very easy process. It doesn’t require any registration procedures. To book ticket customer should first go to the website. Then select their destination route and departure time and date and departure point. In the new page customer will have to enter their information like name, mobile number and email address. Then customer will pay the bill. Paying bill for booked ticket is also easy process. Customer can pay the price of the ticket by any mobile banking, credit card or debit card. Cash on delivery is also possible. After payment, ticket will be provided to the customer. Hanif Paribahan is one of the oldest bus service in Bangladesh. They have the largest number of bus too. They are also remarkable because they provide buses in most routes of Bangladesh. Thanks for reading this article. If there is any change of their offices, please let us know by comment.